Bordentown, NJ - June 10, 2008 — Racquetball players are very particular when it comes to equipment for their feet since the right footwear can lead to improved footwork which can be the difference between winning and losing. 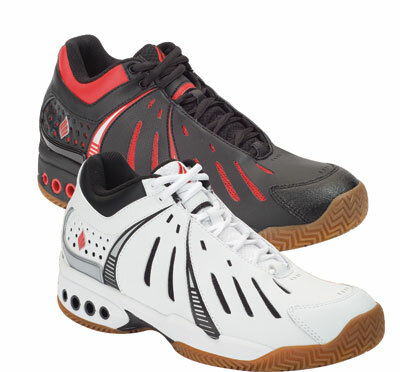 Now, after months of exhaustive design and on-court play-testing, Ektelon is launching O Series and in the process is taking footwear to a “hole” new level - as evidenced by the new O-Port ventilation system designed into the upper portion of the shoe to deliver exceptional breathability. O Series also builds on the success of the original M Series line by delivering improved Precision Tube technology which rounds the tubes for maximum energy return and greater shock absorption. Coming in a mid profile, the OC-1 performance shoe is built to provide players with ultimate support and features a gum rubber outsole in an aggressive herringbone tread pattern to allow greater traction, quicker acceleration and improved lateral stability. The OC-1, will be available in two colorways starting July 15, 2008 wherever Ektelon products are sold. For more information, and images of O Series footwear, log onto ektelon.com. Based in Bordentown, New Jersey, Ektelon is a division of Prince Sports, Inc. Ektelon has enjoyed the longest, most successful reign of dominance in the sport of racquetball. Ektelon’s heritage includes the introduction of more revolutionary technologies and programs to the sport of racquetball than any other company. Ektelon innovations include oversized racquetball racquets, the Racquet Taper System (RTS), Power Ring® racquets and Total Racquet Customization. In 2005 the Company introduced its O Tech platform by launching O3 racquet technology. Since then, O3 has led to many successful Ektelon racquet launches propelling the company’s market share to its highest in over a decade. Ektelon currently has the top two players in the world. Rhonda Rajsich, who has been the #1 WPRO ranked player for three straight seasons and Rocky Carson who ended 2007-2008 ranked #1 on the men’s side. With Rocky’s #1 ranking, Ektelon has had the top ranked pro on the IRT men’s tour four out of the last five years. For more information on products, players or programs, please call 1-800-283-2635 or log onto our website at ektelon.com.